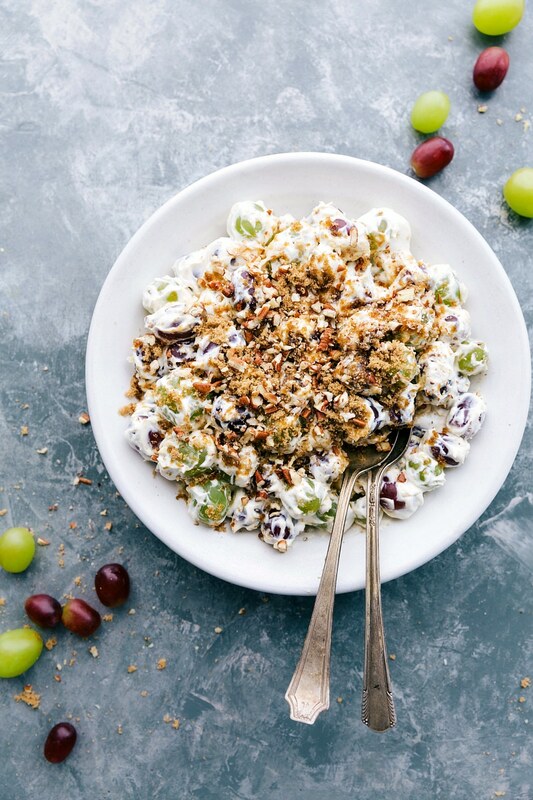 This grape salad is a classic dessert “salad” with green and red grapes, a creamy dressing, and a sugared pecan topping. This salad is fast & easy to make and goes well with SO many different dishes. This crunchy, tangy, and creamy salad whips together in 15 minutes or less and has only 7 ingredients! It’s easy to make this dish ahead of time and also transports easily making it perfect for serving at a holiday dinner such as Easter, Thanksgiving, or Christmas. I’ve always loved dessert salads and I’ve shared a few of my favorites on this site such as this raspberry cheesecake fluff, this frog eye salad and of course the famous watergate salad. 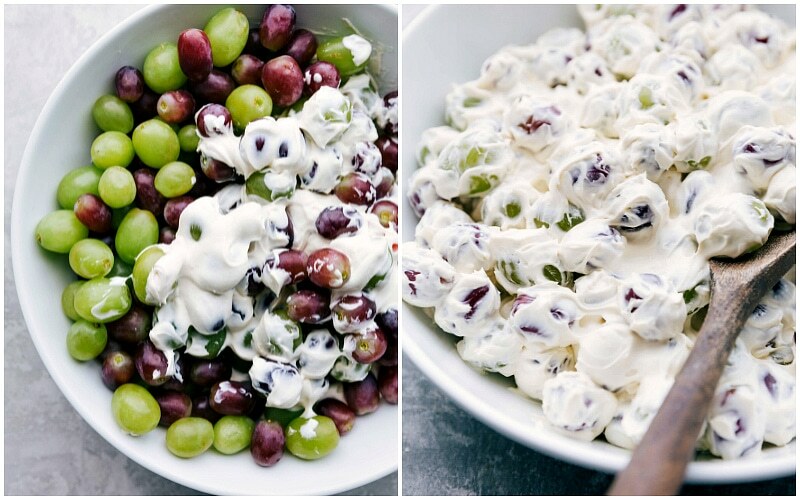 Today I’m excited to share another one of my favorites – this delicious, creamy grape salad. 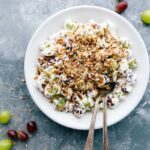 It’s a very versatile salad too – grape salads are great at barbecues, picnics, parties, and alongside any holiday spread. We’ll definitely have it on the table this Easter! Prep grapes: thoroughly wash and dry the grapes. 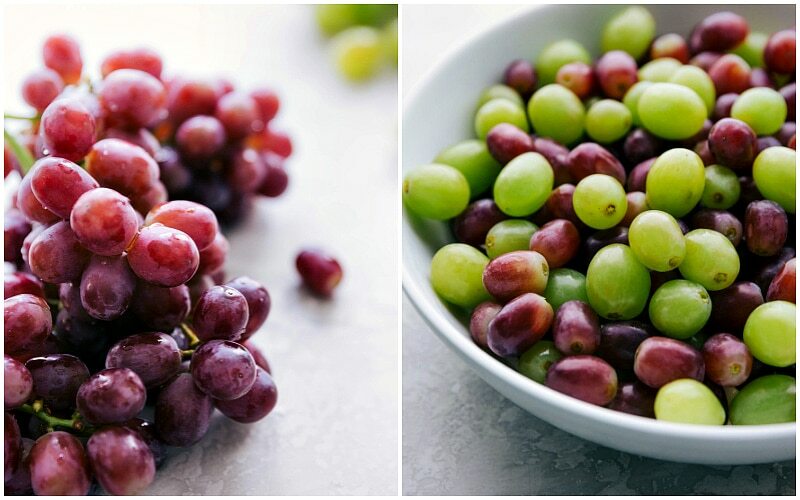 Use a salad spinner OR rub the wet grapes in between two kitchen towels to get these grapes dry. Beat the softened cream cheese: it’s important for the cream cheese to be smooth before adding other ingredients or it will turn the dressing bumpy. Add remaining dressing ingredients: I love adding fresh citrus juice to amp up the flavor and make it slightly more fruity. Chill: the grapes and dressing chill for at least one hour and then you’ll top the salad with chopped pecans (or walnuts!) and brown sugar right before eating! Reduced sugar: reduce or even entirely omit the sugar addition. Reduced fat: you can use reduced fat cream cheese, but the dressing is less sturdy and a bit less flavorful. But again a good option if you’re looking to reduce the calories in the salad. We’ve made this salad before with vanilla honey Greek yogurt in place of sour cream. We still prefer the sour cream version, but the Greek yogurt is really delicious and works as a healthier option. Good grapes: the best way to make sure your grapes will taste delicious? Taste one from the bunch at the store to make sure you’ve got a good bag OR check out these tips for picking out good grapes. Remove the cardboard box and inner foil wrapper from the block of cream cheese. Place in a microwave safe bowl or plate and microwave for 15 seconds. Flip the block of cream cheese over and microwave for another 10-15 seconds or until softened. Time will vary depending on your microwave; just remember you want it softened not melted. 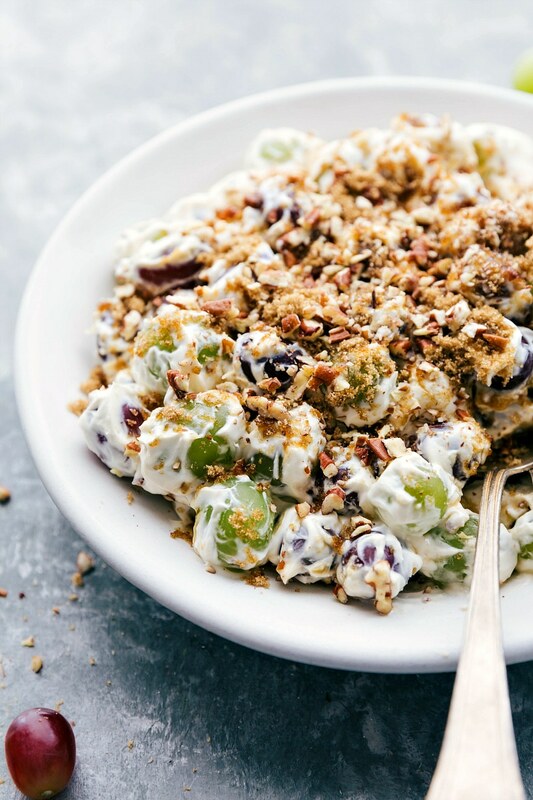 This grape salad is a classic dessert "salad" with green and red grapes, a creamy dressing, and a sugared pecan topping. This salad is fast & easy to make and goes well with SO many different dishes. GRAPES: Thoroughly wash and dry grapes and remove from stem. DRESSING: In a large bowl, beat softened cream cheese with hand mixers until completely smooth. Add in sour cream, powdered sugar, lemon juice, orange juice, vanilla extract, and sea salt (balances sweetness). Beat until smooth and creamy. Fold in grapes until evenly coated. Cover with plastic wrap and place in the fridge for at least one hour up to 8 hours. TOPPING: Right before serving, sprinkle on brown sugar and chopped pecans. Add toppings to preference - we usually add 3 tablespoons brown sugar and 1/3 cup pecans. Customize how much sugar you use IN and on top of this salad to suit your personal taste and the sweetness of your grapes.